Haku-un Co., Ltd. is recognizes strongly the importance of personal information protection,along with compliance with the ” Act on the Protection ” , and established the personal information protection policy in order to properly protect the personal information in their daily business activities , we will comply with this . In particular, personal information of customers , we are of the necessary essential to offer services to customers , legal proper handling , our personal information you provide on the basis of trust from our customers We believe that social responsibility imposed on . Therefore, we , in order to try all possible measures to protect your personal information , we will comply with the following matters. 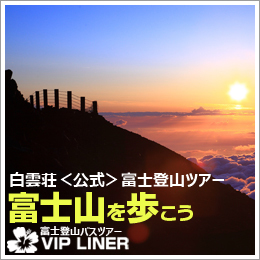 Haku-un Co., Ltd. is carefully accordance your personal information that you provide when you use Fuji eighth station of mountain hut “Haku-un-so ” (hereinafter the Site ) to the ” principle of the protection of personal information .” we are committed to handling , protection of privacy. 1. If the Company has occurred , you will need to contact you for some reason. Personal information that you provide from customers , and handle carefully , except in the following cases , there is no be provided or disclosed to third parties . We at all sites to manage , loss of your personal information , we have implemented security measures to prevent the misuse and alteration . In addition, in order to comfortably use a web service in the data that is sent from the server to your PC , some of the site pages use the ” Cookie “. This site , in order to provide useful information and services to our customers , we are on the links to web sites of other companies and organizations ( home page) . Collection of personal information , which is performed by the linked web site ( home page) , in regard to handling , we do not do that you bear any responsibility . We ask that you please use by your own judgment. This site , the person in question is disclosure of their personal information , correction , if you wish to , such as stop , or erase the introduction of services , after confirming that it is the person in question , will respond appropriately . Please request to each contact you provide your personal information . If you have any changes to the customer’s registration information , we ask that you please immediately contact us. Make the changes , correction, deleted by the offer .